As car driving challenges go, this is probably one of the hardest - and daftest - there is on the Internet at the minute. The idea is partially given away in the title: ‘The Cutting Edge Stunt’. In short, it involves fastening a blade to the rear of an M2 Competition, getting the tail out, and aiming for a row of bamboo poles. The stunt, which has taken many months of planning and fine-tuning according to director Oisin Tymon, was not just for show. There was a new world record at stake, too. And it has all been captured in a seemingly Thor-inspired setting. 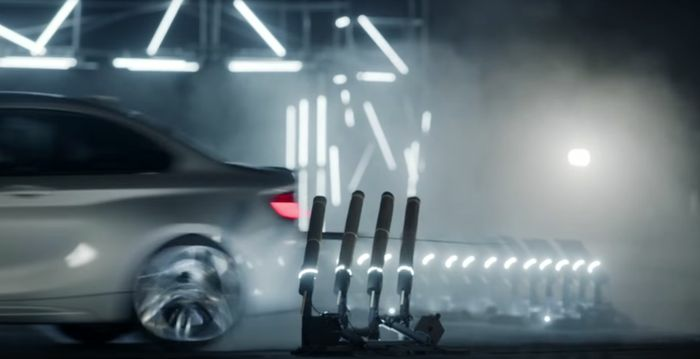 The previous best was 87 straws, but BMW cut that down to size - if you will excuse the pun - by destroying 117 rolled-up bamboo mats in under sixty seconds. To make it easier for the driver, these rows were arranged in a half moon shape so the blade on the back of the largely showroom-specification car could scythe through these during the drift.